How to Avoid Folding Clothes Forever AKA Procrastination – Monkeys in my house! I have some clothes that I need to pack up and move out to the shed (by “some” clothes, I mean everything my girls ever wore between 12 mo and 3T and a few castoffs that none of them like, plus everything the ONE boy child in the house outgrew) and I don’t waaaaaaaaaaaaant to!!! 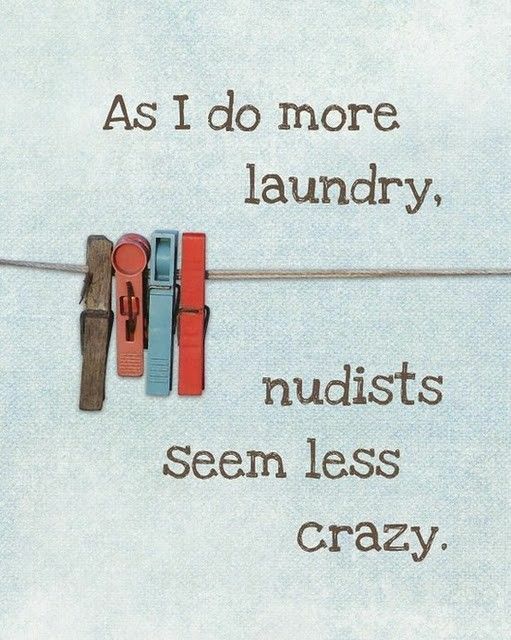 I am SO sick of folding and refolding, packing and unpacking that I’m about to move us all to a nudist colony! You think I’m kidding, I know, but right now, internet, I have never been more serious in my life. I’m as serious as I was when I wanted to invent a time machine so I could go back to the Wild West days and become Annie Oakley #2. That’s been a few years ago. I am now wiser, and seriously love modern conveniences such as a toilet IN the house, a gas furnace, hot water out of the tap, and an electric stove. I also have more mature desires and wishes such as finding my long lost wizarding family and getting my kids into Hogwarts. I have a tepid interest in folding clothes at best and I’ve set for myself the task of organizing my kids’ outgrown clothes and castoffs so I can sell them. Not my best idea, but then again, I rarely have those. They wouldn’t be best ideas then, would they? If every single idea was your best idea, what would happen to your worst ideas?? They’d be lonely, that’s what. All of this before 11 AM. I even slept in until 7:30 and didn’t start the pancakes until 8:30! So the lesson I’m learning here is, if there’s some stuff I need to get done, I should prioritize the ONE thing that I do NOT, to my very atoms, want to do and I’ll spend the rest of the day being so productive that I won’t feel guilty at the end of the day! Now to really go fold those stupid clothes. I’d fold your laundry. I love to do that. I love to sort socks. I’m weird and crazy, I know. I can’t help it, I just love it. Want me to find an empty very small apartment nearby so’s I can come over from time to time and do that?????????????? ?